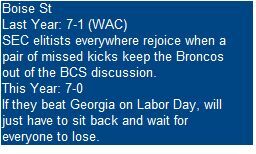 It's time once again for the weekly (though some might call it weakly) tradition where I give you 10 picks against the spread for your entertainment pleasure. Over the 4 seasons (and Frankie Valli) during which I have made these picks, my winning percentage has hovered right around 53%, or just above the break even point for gamblers. Here's to a winning percentage more robust this year. As always, home teams are in Bold. Over the past two seasons, IA mid-majors have taken on IA mid-majors 12 times on the season's opening weekend. The favorites are 2-10 ATS (Against the Spread) in that span. 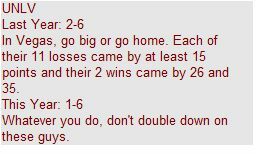 Double Digit favorites are just 1-4 ATS, and home favorites are just 1-7. 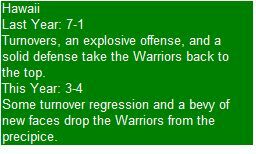 In fact, the favored team is just 5-7 straight up in those 12 games! Florida International was the Sun Belt co-champ last season, and is rightfully favored to contend again. However, North Texas was much better than their 3-9 mark last season and seem poised to give the Panthers a game in Miami. 20 months ago, these teams staged a bowl game classic on Boise's blue field in the Humanitarian Bowl. Last season, both teams stumbled, with Bowling Green taking the larger plunge and falling to 2-10. The previous logic of mid-major versus mid-major applies here with the additional fact that Idaho must replace the maestro that made their team competitive the past two seasons in quarterback Nathan Enderle. With a new, relatively untested player under center, the spread in this game should be closer to a field goal. Once again, we have the mid-major versus mid-major angle here. Southern Miss has the tools to win their first Conference USA championship since 2003. The Golden Eagles do play well at home (11-5 against IA schools under head coach Larry Fedora), but they are far from invulnerable ATS (9-7). Louisiana Tech is in the second year of Sonny Dykes' 'Air Raid' offense and could be one of the real sleeper teams in the WAC. The Bulldogs are worth a play here. Deja vu? 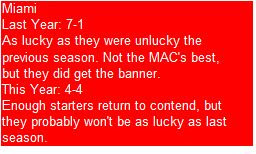 The mid-major versus mid-major logic once again applies here. New Mexico State is a bad team, but Ohio is traveling a great distance (over 1600 miles if you believe Google Maps). Ohio may be a contender to win the MAC, but they are not a college football power. A touchdown is too much for them to be giving in this game. Texas A&M is what I like to call a surprise top-10 team. Ranked 8th in the preaseason AP Poll, the Aggies were unranked in last year's preseason AP Poll. From 2006-2010, 7 teams began the season ranked in the AP top-10 after beginning the previous season unranked. They were, West Virginia (2006), Notre Dame (2006), Wisconsin (2007), Missouri (2008), Clemson (2008), Ole Miss (2009), and Oklahoma State (2009). Those teams all enjoyed some modicum of success, but were overrated by the general public. Only Ole Miss posted a winning record ATS (6-5). Collectively, those 7 teams went just 34-48-2 ATS. If you're wondering, that's a winning percentage of 41%. SMU may not win in College Station, but betting against the Aggies should be a good practice this season. Auburn is a shell of their BCS Championship team from last season, but as long as Gus Malzahn is the offensive coordinator, they should light up the scoreboard against teams like the Aggies. Remember, in 2009, before Cam Newton came on the scene, Auburn put up 91 combined points on Louisiana Tech and Ball State with Chris Todd, yes Chris Todd, at quarterback. They should win this game by about 4 touchdowns. Last season, Miami was very successful. They won the MAC, won 10 games, and lost to Missouri by 38 points. Miami doesn't figure to be better this season with a new coach and new schemes, and while Missouri may be a little worse, they should be able to cover a spread smaller than 3 touchdowns. Since 2006, Clemson is 5-2 ATS versus IA mid-major teams (not named TCU). Clemson was bad offensively last season, so despite the loss of a senior quarterback, they should actually improve a bit. They won't suddenly become Oregon, but they should be closer to average if not a little above. Defensively, they are consistently one of the top-20 programs in the nation. Troy shouldn't be able to generate more than a pair of touchdowns against the Tigers, so if Clemson can get to 30, they should cover this number. Oklahoma may well be the best team in the country. Outside of last season, when Utah State and Air Force played the Sooners close, they usually dominate lesser foes at home. Under Bob Stoops, the Sooners are 19-1 versus mid-major IA teams (lost versus TCU in 2005). The average score of those 20 games has been Oklahoma 43, opponent 12. The Cougars have revenge on their mind. Last season, they rolled into Los Angeles as 3 and a half point favorites, but were waylayed 31-13 by the Bruins. Perhaps more importantly, the Cougars have their star quarterback, Case Keenum, back. Keenum tore his ACL against the Bruins and was lost for the year. Without him, a combination of defensive ineptitude, turnovers, and a slight decline on offense led to their first losing season since 2004. With him, they have a chance to win the conference and should dispose of a Pac-12 also-ran with relative ease. It's almost here. Less than one week until kickoff. 5 days and counting. Today is the last of the season previews, focusing on the 4 remaining independents. To see last year's independents preview, follow this link. Is this the year Notre Dame finally returns to elite status in college football? Can they reclaim their place as a perennial national title contender under Brian Kelly? The best I, or anyone else can offer now is some conjecture on the matter. I think Brian Kelly is one of the best coaches in college football and stands a great chance at turning the Irish back into an elite program. Of course, that's just an opinion. A better question to ask may be, when was the last time Notre Dame was an elite program? 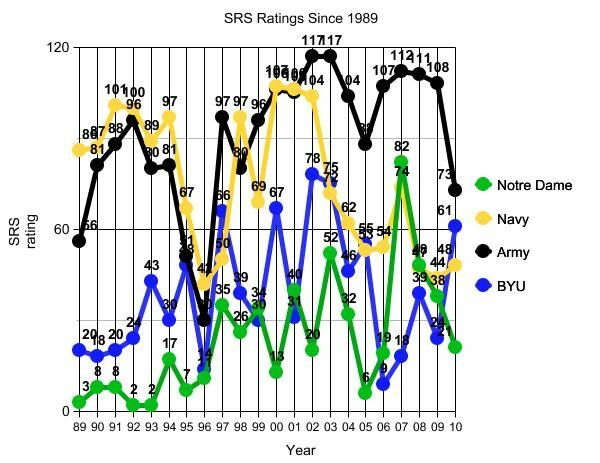 To answer that question, I went back and looked at the SRS rating for Notre Dame since their last national championship in 1988. The SRS rating, or Simple Rating System, is as its name suggests, a simple system for rating college football teams. It takes into account who you beat (schedule strength adjusted) and how bad you beat them (margin of victory is accounted for up to a point). Its probably not the greatest rating system ever designed, but it can give us a quick and dirty idea of how good a team was. 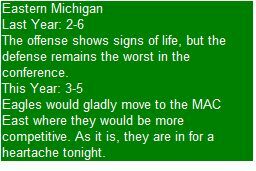 Plus, its easily found on a website I frequent anyway, college football reference. Check 'em out sometime. The table below lists the SRS ranking (not rating) of Notre Dame among all college football teams for each season since 1989. I also included the other three current independents (Navy, Army, and BYU) as a frame of reference. Remember, since this is ranking among college football teams, so being lower on the graph is better. In the final 8 seasons of his Irish coaching career (1989-1996), Lou Holtz led Notre Dame to a top-10 SRS ranking 6 times. Since then, they have finished with a top-10 SRS ranking once, in Charlie Weis' first season (2005). Simply put, Notre Dame has not been an elite program for at least a decade and a half. Friends, we have made it to single digits. Just 9 more days and the season is here. Today is the penultimate preview, and the last true 'conference' preview. On Saturday, Statistically Speaking will preview the final four teams, all Independents. 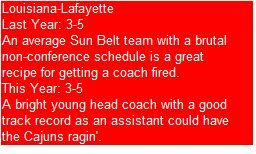 To see last year's Sun Belt projections, follow this link. Nothing has come easy for the Sun Belt in its 10 years of existence. No Sun Belt team has ever been ranked in the AP poll, the conference has never finished a season with an aggregate winning record, and Middle Tennessee State in 2009 has been the only team to reach double digit wins. The Sun Belt and its member schools typically serve as cannon fodder for BCS programs looking to add another win in the coffers to attain bowl eligibility. But every once in a while, the little guy strikes back. Sun Belt teams have beaten opponents from BCS conferences 12 times. The following table lists those wins in (somewhat) chronological order. 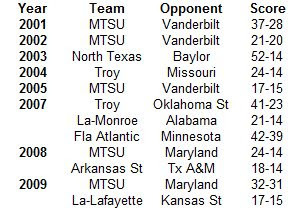 One of the more interesting tidbits from those 12 wins is that Middle Tennessee State owns 5 of them. In addition, those 5 wins have come against a pair of common opponents. In the early part of the decade, Middle Tennessee beat Vanderbilt 3 straight times over 5 seasons. The last loss was especially crushing for Vanderbilt, as it cost them a bowl bid (finished 5-6). More recently, Middle Tennessee has beaten Maryland twice in the past 3 seasons. The only other Sun Belt team with multiple wins versus BCS conference opponents is Troy. The Trojans ambushed a pair of Big 12 teams in 2004 (Missouri) and 2007 (Oklahoma State) at home. Perhaps not coincidentally, the Trojans have not been able to convince a BCS conference team to come to their place since beating the Cowboys. Only 13 more days and 3 more previews to go before the season begins. Today we turn our attention to the Big 10's little brother, the Mid-American Conference. To see how the projections fared last season, follow this link. One of the biggest reasons for Toledo's improvement 3-5 in the MAC in 2009 to 7-1 in 2010 was their almost magnetic like attraction to the football when their opponents had it. Toledo forced an amazing 27 turnovers in their 8 league games (after forcing only 10 in 2009). This combined with the relative dearth of their own turnovers (9 in league play) gave them an impressive turnover margin of +18. The Rockets were in the black in turnover margin in each of their 7 wins and were in the red in their lone loss. How likely is Toledo to recreate their ball hawking ways in 2011? To answer that question, I looked at which MAC teams did the best job of forcing turnovers since 2006, and then how they performed in the following season. It should come as no surprise that Toledo's 27 forced turnovers was easily tops over the past 5 seasons. If history is any indication (and it usually is), Toledo is in for at least a marginal decline in the number of turnovers they force in 2011. Each of the other high-turnover producing teams forced at least 3 fewer turnovers the next season, and a pair (Kent State and Western Michigan) saw their number drop significantly. Toledo is getting a lot of love as the preseason favorite in the MAC West, and while they should be contenders, sans an unbelievable turnover margin, they are not division's best team. Just a shade over 2 weeks remain for the start of football season. Here at Statistically Speaking, we are winding down our conference previews. Just 3 more to go after today. To check out last season's WAC projections, follow this link. The WAC Going Forward: Who Takes Charge? 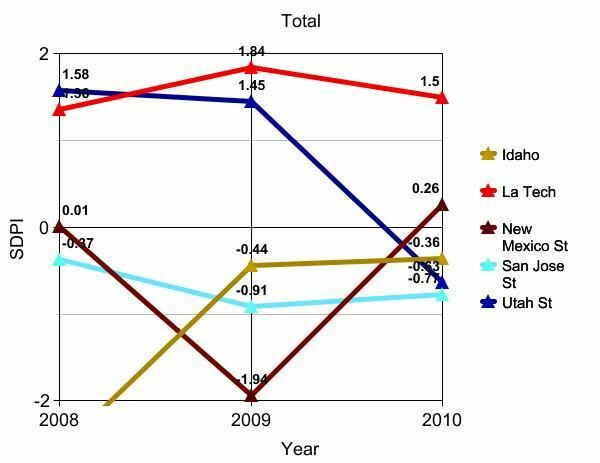 In the last preview, I analyzed the Mountain West and where it had been in the previous 12 seasons. This week, I'm analyzing the WAC and where it could be headed from here on out. Boise State, the WAC's strongest program, is now in the Mountain West, and the 3 remaining powers, Fresno State, Hawaii, and Nevada, will be joining them next season. That leaves the WAC with holdovers Idaho, Louisiana Tech, New Mexico State, San Jose State, and Utah State. The WAC will also add Texas-San Antonio and Texas State in 2012, but those programs will be making the transition to IA. In fact, Texas San-Antonio has not even played their first game yet! While both schools are coached by men with a modicum of success in their previous stops (Texas-San Antonio is coached by Larry Coker and Texas State is coached by Dennis Franchione), they will likely struggle in their first few years of IA football. So who among the remaining 5 will assume the role of favorite? Here's how the 5 remaining teams have performed against each other for the past 3 seasons. Louisiana Tech has been the strongest amongst the remaining 5 teams, losing just twice in the past 3 seasons. Perhaps more impressively, both those defeats came by a combined 3 points, while 7 of their 10 wins have come by double digits. 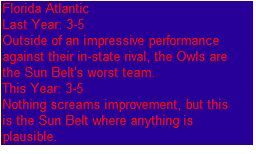 So it appears Louisiana Tech is the team to beat going forward, but let's dig a little deeper. I went back and calculated SDPI ratings for those 5 teams over the past 3 seasons, but only in games involving each other. Conference games against Boise State, Fresno State, Hawaii, and Nevada get ignored. Instead of the usual tables, we'll use charts this time to track each team's progression. We'll begin with offensive SDPI for the past 3 seasons. Again Louisiana Tech has been stands out from the other 4. Their offense has played consistently well over the past 3 seasons. 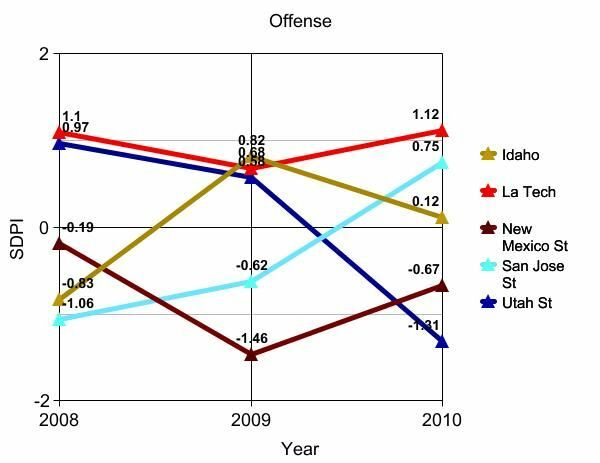 Some other interesting tidbits: Idaho enjoyed a sizable offensive jump in 2009 (when they not coincidentally played in a bowl game). 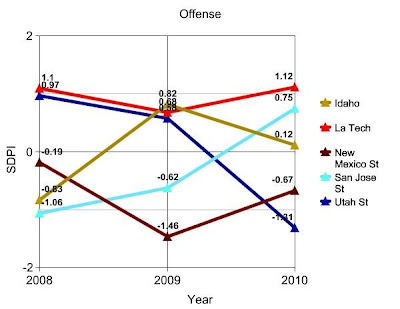 Utah State cratered in 2010, going from a very good offense, to the worst among the 5. San Jose State has steadily improved on offense since their awful performance in 2008. Now let's look at the defenses. 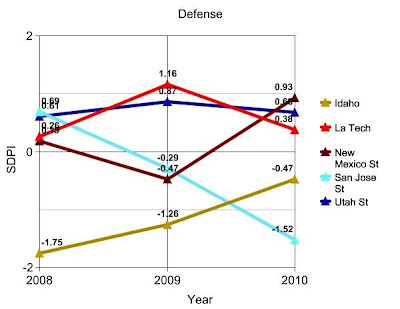 Louisiana Tech has been consistently strong on defense as well, but check out Utah State. 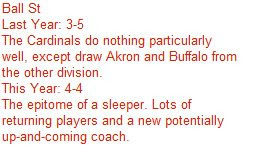 one has to wonder how good they could have been in 2010 if their offense didn't struggle. Idaho has started a slow climb out of a deep defensive hole, while San Jose State has gone the other way (good thing they have all their starters back in 2011). New Mexico State struggled when they changed coaches in 2009, but in their second year under DeWayne Walker, they improved a great deal. So we've looked at offense and defense, not let's examine total SDPI. Louisiana Tech has been the only one of the remaining WAC teams to be above-average in each season since 2008. Idaho began their journey off the board, improved and then maintained. New Mexico State imploded, and then rebounded. 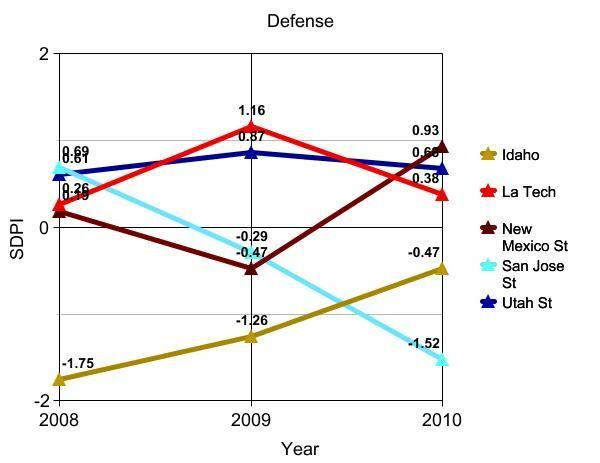 Utah State played well in 2008 and 2009, but struggled in 2010. Finally, San Jose State has maintained a relatively consistent below average performance. So, now let's try and answer the question: Who takes charge? It's obvious Louisiana Tech is in the best position to lead the WAC going forward. They have the best record and best track record of recent performance. However, as the charts show, no other team has been consistently strong. There is ample space for a second banana, and it could come from any of the other 4 teams, or perhaps from one of the newbies. Just 3 short weeks. That is all that separates us from kickoff. Now if we can just get past the dog days of August, everything will be fine. In this edition of our conference previews, we come to the Mountain West, the strongest of the mid-major leagues. To see how the forecast went last year, follow this link. From the beginning, the Mountain West was basically a stronger version of the WAC, or if you prefer, the WAC on steroids. Its 8 original members, Air Force, BYU, Colorado State, New Mexico, San Diego State, UNLV, Utah, and Wyoming had all been members of the WAC. Some had been in the WAC since the beginning (BYU, New Mexico, Utah, and Wyoming were founding members in 1962), while others were of the Johnny Come Lately variety (UNLV joined in 1996 when the WAC ballooned to 16 teams). So its no surprise that the Mountain West has again poached the WAC's best, with Boise State joining the conference in time for the 2011 season, replacing outgoing BYU and Utah. The Mountain West will have even more former WAC teams in 2012 when Fresno State, Hawaii, and Nevada join up. The Mountain West has made itself the preeminent mid-major league, but looking back on its brief history, its clear there have been two distinct periods in Mountain West history. 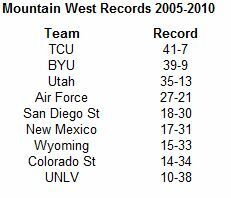 The Mountain West has been around for 12 seasons. From 1999-2004, they were an 8-team league. Prior to the 2005 football season, TCU joined, giving the conference 9 teams. Not that the conference intended it this way, but the Mountain West played 6 seasons with 8 members and 6 seasons with 9 members. Comparing each team's cumulative league record among both periods yields some interesting results. Results I'm sure many college football fans had forgotten. 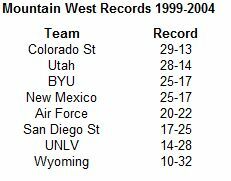 In the period from 1999-2004, the team with the best record in the Mountain West was Colorado State, a team that is just 2-14 over the past 2 seasons in league play. The Rams were still peaking under legendary coach Sonny Lubick when the Mountain West was formed in 1999. They won or shared 3 of the first 4 league titles and posted just a single losing conference record in the first 6 years of the Mountain West's existence. Utah, buoyed by a combined 13-1 league mark in 2003 and 2004, that coincidentally made household names out of Alex Smith and Urban Meyer, was a close second. 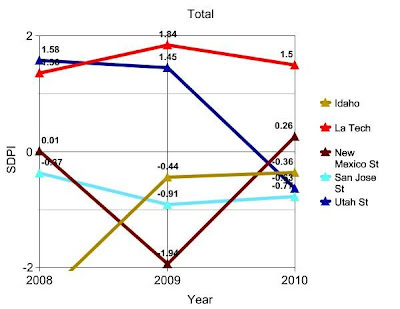 New Mexico, which reeled off 3 consecutive 5-2 league marks from 2002-2004 was also a league power. Air Force floundered around the middle of the pack and Wyoming brought up the rear. So, what happened when the league expanded to Fort Worth? The New Kid in Town, TCU, promptly ran roughshod over the conference, losing just 7 league games in 6 season. And what of former league overlord Colorado State? The Rams fell on hard times, winning 5 league games in 2005, but failing to finish with more league wins than losses since. BYU finished a close second to TCU, winning a pair of conference titles, but failing to go unbeaten overall and missing out on the bounty that BCS bowl appearances brought Utah (2008) and TCU (2009 and 2010). Another former contender, New Mexico, also fell on hard times, winning just 4 times in their last 24 league games. The Mountain West will go through a one-year transition period in 2011 with a pair of mid-major national powers (Boise State and TCU) on board. However, in 2012, TCU will leave for the greener pastures of the Big East and the league will add the aforementioned trifecta of WAC schools to replace the Horned Frogs. When 2012 gets here, a new era will dawn for the Mountain West. The 3 teams that led them to mid-major notoriety (BYU, TCU, and Utah) will be gone, 2 of them to conferences with automatic BCS bowl tie-ins and another to conference independence. What will the next 6 years of Mountain West football bring? One can't be sure, but with 3 overlords departing and only one ascending to take their place, there will be ample opportunity for a team like Air Force, or Nevada, or San Diego State to become part of the ruling class in the Mountain West.